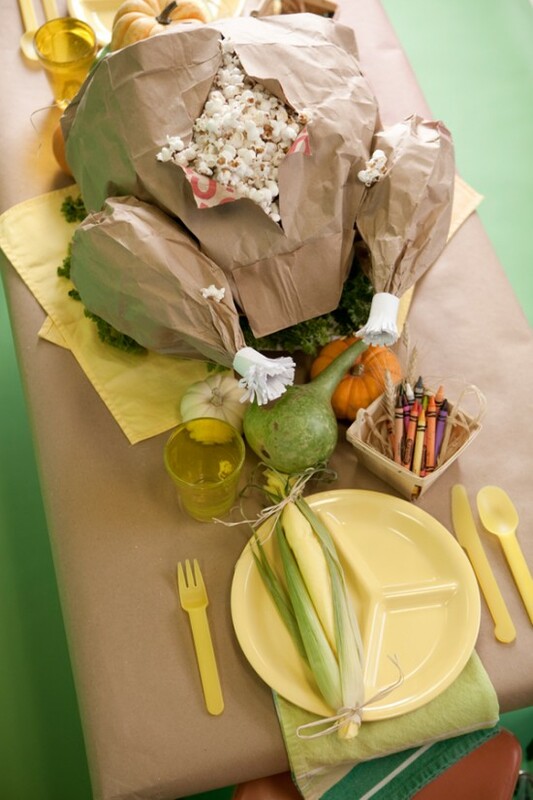 I loved Thanksgiving growing up. We'd head down to my great aunt's house in Florida, 30 minutes from Orlando (Hooray!!). Every year driving up to her house, I was fascinated with the real orange trees growing in her front yard -- I would always go pick a bunch and have her make fresh squeezed orange juice for me and my cousins. She was fabulous with us children -- fun and carefree, and I made some wonderful memories all of those Thanksgivings. The one not-so-great memory I have is always being stuck at that plain vanilla card table, loving referred to as "The kids table." And it was. We were lucky if we got a tablecloth. And oh, the isolation. While the adults were in the other room laughing and cutting up, we were stuck at this "isolation station" feeling left out and worried that we might have to eat EVERYTHING on our plate before we could get our hands on that pie! So that's why when I saw this post yesterday at One Charming Party, I just knew I had to share her creative bent on the Thanksgiving "kids table." 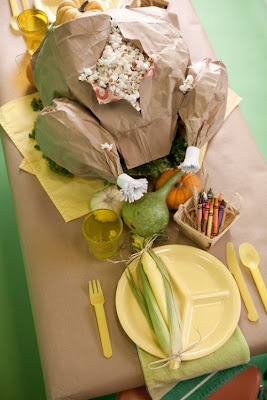 From the craft paper covered table where the kids can draw and write until their little hearts are content, to an amazingly creative popcorn-filled turkey that is carved just like the real one. 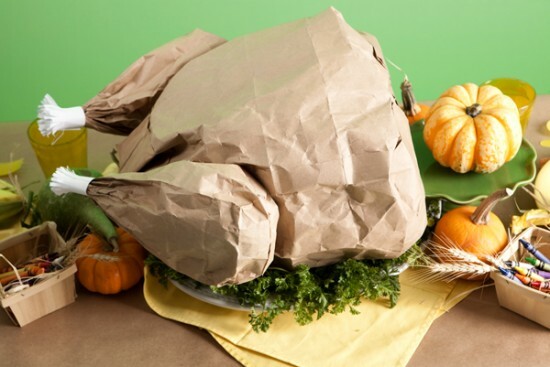 This time, however, there's no meat in that bird. 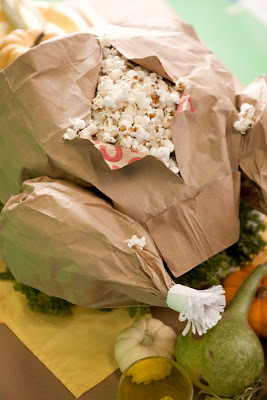 To the kids' surprise, out pops yummy popcorn! How fun is that? Brittany shows us all how to do it, too. 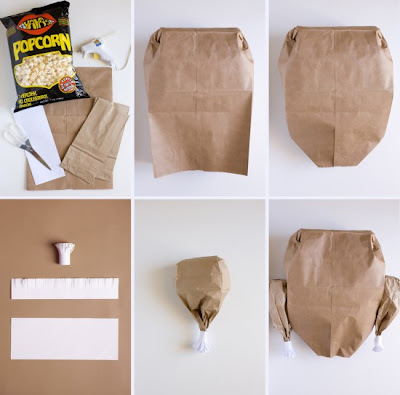 A grocery paper bag, some small paper bags and some popcorn -- cool, cool, cool! 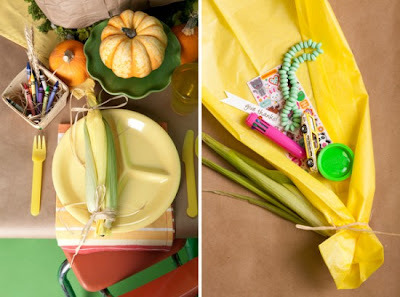 Another great idea that Brittany shows is the corn husk favor bags. Cute! Filled with a few of our children's favorite things -- candy in particular! Adorable! And this is one we all can do! 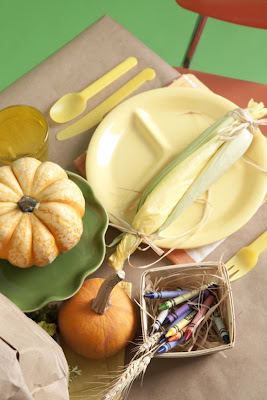 Go on over to One Charming Party to see more of the details on this fun-filled thanksgiving table for kids.